Today's lesson went awesome. 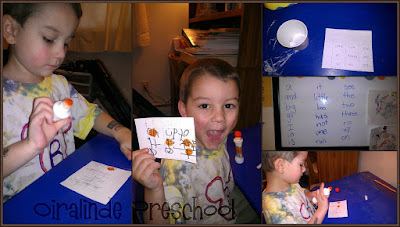 Last night I had a brilliant idea: sight word Bingo! It was the first thing we did in school today, and Sebastian loved it. I wrote all the sight words we knew up on the board, and he picked 9 to write on his card. I also picked 9, and then I cut out the words and put them in a cup. We took turns pulling out the words and Sebastian would read the word and we would put a dot on our Bingo cards (if we had the word). I won the first game, but Sebastian won the second. He asked to play it tomorrow, and I told him we would. I cannot deny a fun and educational game. Left: Sebastian marking a word he pulled. Center: Sebastian showing off his winning board. Top Right: My board and the cup with our sight words inside. Middle Right: the list of sight words Sebastian knows as of today. Bottom Right: Another action shot of Sebastian playing Bingo. His handwriting today wasn't the best, but he was reading well. One step at a time. I am going to make our game boards a little bigger for tomorrow, and add the Handwriting without Tears boxes in them so that he writes the letters correctly. This is a game to remember for the future.